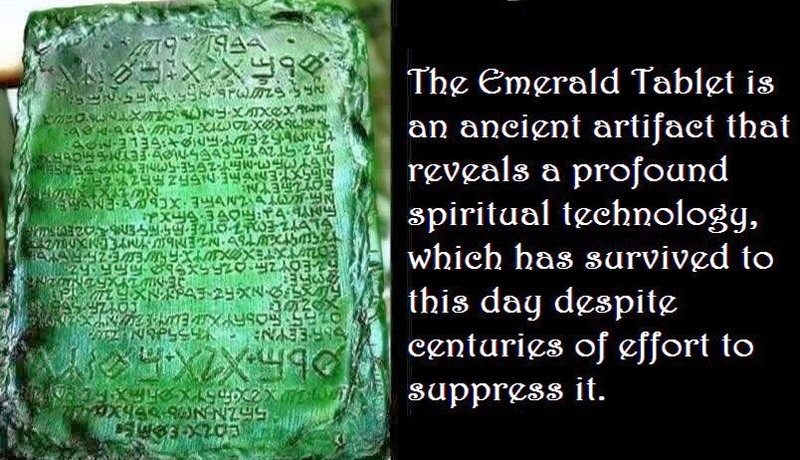 Home » The Emerald Tablets – What Are The Halls of Amenti? The Halls of Amenti are between the highest and lowest dimensions, distorting the only Truth that exists in the Universe. The Omega Point stands for Divine Reason = Wisdom = Unconditional Love. The Halls of Amenti act as a distortion filter between our physical being and the Soul. It is the realm between the Omega Point and our 3D world. Reincarnation happens from the Halls of Amenti back to the physical body. The term Omega point (and Noosphere) was first coined by Pierre Teilhard de Chardin, and stands for the highest level of consciousness. The Halls of Amenti, the ultimate hall of mirrors, is the realm of the great illusion that is only passable by knowledge and wisdom. After passing the Halls of Amenti merger with the Omega Point follows. According to the String theory or M-theory, the 3-dimensional physical world we experience has at least 7 (10 in total) dimensions above. Any Theory of Everything will claim many more dimensions than just 3. The Halls of Amenti are situated in the higher dimensions, and ruled by a pure energetic Entity that religions call Lord the Almighty, Yahweh or Allah. This entity is in all cases one and the same – the entity that Plato called the Demiurge. Plato understood what it was. This ruler of the Halls of Amenti operates like a filter disturbing our connection with our highest being, the Soul. This is a powerful, pure energetic entity. The highest dimensions are ruled respectively by the Human Soul (Sophia = Wisdom) and the Nameless (Love). And the intermediate dimensions are ruled by the Demiurge, which every soul has to pass to merge with the Omega Point. This hypotheses is verifiable in the Nag Hammadi Codex, which confirms exactly the same concept. The material world is a projection of the highest Truth down to the lowest projection, where it becomes a tangible hologram which we call matter. It has similarities with Plato’s treatise on the allegory of the cave where cavemen were looking to their shadows on the wall instead to the source (the light) that was behind them. Matter is the result of Minds. And that might be very hard to understand. Everything seems to be on its place and tangible, isn’t it? So, how can it be an illusion then? AS ABOVE SO BELOW. The Halls of Amenti exist between the 3D world and the soul world. Between the frequency domain and the space time domain. Between 3D and the highest dimensions ( 6). We learned from our birth to rely on our senses, and we are conditioned to think in terms of matter over mind. We learned that our physical brains produce all our thoughts. At school and study we are trained to rely on our senses as organs of truth. We learn to probe the world through our senses. Because we are conditioned in that way, we are unable to unlock the Universal Secrets. When we solely rely on our senses, we are not able to understand the truth. What our senses perceive is converted into signals, which is interpreted by our brain as to be real. But there is no way to verify the thing we perceive is actual the ‘truth’, other than a material representation. We lack organs of truth. The ultimate truth is only mentally conceivable, and especially by grasping the mathematical reality intuitively. Our universe is 100% mathematical, that is why the unreasonable ‘god’ of the Old Testament is no true god. Pure reason is a divine quality, that is why so many people feel attracted to mathematical patterns. The true essence of the Human Soul is divine, but tragically have most people no idea what they really are. The Omega Point is the only true reality, all lower dimensions are illusions. Let’s assume that a square from the 2nd dimension could speak and would explain how a cube from the 3rd dimension would look like. It would sound funny in both dimensions. In fact it’s impossible to express in our language the full meaning of a higher dimension. It’s only possible by developing a feeling (intuitive mathematics) from the inside, through our Soul. To equally combine feelings with reason is utterly crucial to grasp the Ultimate Truth. Meditation is the key to that. Everything that’s written in the Emerald Tablets has to be lifted to the highest dimension and not to be taken literally on our 3rd dimension. The Fall of the Rebel Angels who created ‘the Halls of Amenti’ or hell. Ignorance is what keeps The Halls of Amenti on Earth intact. When the Ego is not aware it is a “just” a lower reflection of something higher, the Soul, this ignorance keeps the Ego in charge of all actions, and therefore at the level of ignorance. Every individual is an expression of the Universe. An ever glowing spark from the Eternal Fire. But if an individual is not aware of his true nature, he/she keeps living in the Halls of Amenti. Duality, arrogance, jealousy and darkness exist only by the grace of ignorance. The Entity (God) mentioned in the Old Testament is disobedient from its place of origin – Love. According to Thoth and other (gnostic) sources as well, this is not the highest Entity, but represents itself as the highest Entity. Some call it Lord the Almighty, Yahweh or Allah, all the same figure, that created together with its fallen angels the physical world of Duality and Illusion – the Demiurge or the collective Ego. Man’s quest is to overcome this veil of illusion. Religions are without exception misleading by not explaining how the world of illusion is constructed. The God of the OT is a low revengeful entity. This entity (or deity) disturbs the Universal Truth like a colour filter in front of camera, and makes it even harder to find the truth. Start walking on the pathway of Love. Gaining self-knowledge is the most important step in gaining wisdom, and start to radiate love around you. Why is that so hard? Because in most cases the little ‘me’, the damaged ego, full of self-pity, stands in your way to unlimited freedom. And your Ego is YOUR Demiurge. The collective Ego of communities is THEIR Demiurge. And so on. How the distortion filter works from the 10th dimension down to the 3rd dimension. Who Are Lord the Almighty, Elohim, Yaldabaoth, Yahweh, Allah and the Devil? The highest Entities of the religions on Earth – God, Allah, Yahweh, etcetera – are one and the same Entities as the Devil. The Demiurge – a tricky deity with great power, but nothing more than an (dark) angel with great powers. It is no true God. This deity rules over the Halls of Amenti that must be passed to find Gnosis, i.e. to make the quantum jump to the Omega Point. Reason and Wisdom are the only way out. Faith doesn’t provide the key, and this includes the (atheistic) materialistic science. Christ, Buddha, Lao Tse, Pythagoras, Plato, Teilhard de Chardin and Thoth (Hermes Trismegistus) etcetera are among many others who tell us already for centuries, that the Kingdom of the Highest is already inside you. The Universe is mathematical. It is nothing else. Emotions and faith won’t help to find the keys. Intellectualism won’t help you find the keys as well. Balance is all. Reading will bring knowledge. Sharing your thoughts and reflection with people who stand on your level (or even higher) are the most important things to do in life. Inner reflection, introspection, understanding the driver of your feelings and emotions, is a must to gain consciousness, and this is done by meditation. Socrates already said it: “The unexamined life is not worth living.” Remember that for the rest of your lifetime. One of the best PDF versions available. The Emerald Tablets of Thoth mentions an exercise to live eternal. During one year I managed to master this simple looking exercise. It is amazing simple, incredible powerful and very hard to master.